An intraweekly post from Luciano Pignataro, who was very much impressed by the Clavesana area when we went to the Langhe to taste wines. If you are are simple tourists, this week you can skip over this column. If you instead prefer to travel rather than just hurry though, take this Dolcetto and use it as a compass to discover a Low Cost Langa that is certainly older and more intriguing than what people generally think of at the mention of Langa. Yes, because the wine routes can lead directly from the Barolo Boys who made amazing waves in the 1990s to a 5-Euro bottle produced by the cooperative winery in Clavesana, whose 350 members turn their attention to Dolcetto in the Langa hills. The difference is quite simple: Around Alba nothing but vineyards, like the fields of grain between Lucania and the Murge, and here, at a 30-minute drive, oak forests, chestnuts, vegetable patches, quiet little towns just like ours in the South. The rural spirit of a land not yet overrun by junk TV. Here one understands how important cooperative wineries are for guaranteeing income from agriculture, and the ties of the land with a grape varietal, Dolcetto, which 30 years ago was much more in demand than Nebbiolo. Then things changed, thanks to the increase in the importance of exports, coupled with a decrease in local consumption. Dolcetto is not an Important Wine, rather it's fresh and floral, with nice structure, and perfect for the traditional dishes of the region, starting with the wonderful bell peppers of Carmagnola in anchovy sauce. Fermented only in steel, steel as bright as the steely determination of Anna Bracco, the Cantina's managing director, who gave us a tour one evening, winding beautifully up and down the misty hills as dusk came on. We prefer Dolcetto like this, it has no need of wood to make it enjoyable, just good food. Drink it during chestnut season, and with pasta e fagioli, and with white meats: it will captivate you, and invite you to discover this corner of Italy, a solid hard-working corner far from the limelight and the travel guides. If you're travelers and not tourists, of course. A few weeks ago I talked with Filippo Bartolotta, who mentioned that he was organizing a visit to Chianti for a group of New York wine writers, and asked if I wanted to join in. I was unable to, but did accept his invitation to taste a selection of Chainti Colli Senesi in the Enoteca Italiana, which is located in the Fortezza Medicea overlooking Siena. Chianti was once a geographic term for the region between Florence and Siena, and also to the wine made in the area. The geographic term still holds, but thanks to savvy marketers of the early 1900s, who realized the word "Chianti" helped sell wines and therefore slapped it on anything made in (roughly) central Tuscany, the wine term has, shall we say, expanded, gaining nuanced flavors with time. What was once simply called Chianti is now called Chianti Classico to indicate it comes from (roughly) the original Chianti area. Everything else over a vast area that extends from the Colline Pisane to below Montalcino (far south of Siena), to Arezzo, and to north of Florence was simply called Chianti. However the area is too big to be manageable, and as a result a number of Chianti subzones have been established, to allow the winemakers of the respective areas to tie their best wines more closely to their land, while (if they want) labeling their base wines Chianti, which is now something of a catchall. As one might guess, Chianti Colli Senesi is the Sienese subzone of the Chianti appellation, though calling it a subzone is not quite correct. The Province of Siena, like most of Tuscany, is geologically complex, and there are broad swaths of territory that do quite well as grain fields but are not particularly suitable for vineyards. Therefore the Chianti Colli Senesi zone is actually three fairly large islands (for want of a better term) of viticulturally suitable land separated by the swaths of grain. One of these islands is north of Siena, bordering the Chianti Classico zone and extending via Monteriggioni and Poggibonsi to San Gimignano. The other two are south, one in the western part of the Provice, from Murlo to Montalcino, and the other in the eastern part, from Sinalunga and Trequanda past Montepulciano and all the way to the border with Umbria. Given the extent of the appellation, one cannot really expect continuity of terroir, and indeed differences in terroir do result in differences in the wines. In addition, as is the case with the other Chianti appellations, winemakers have a fairly free hand when it comes to the grapes they use: The Disciplinare says the wine must be made from at least 75% Sangiovese (it can be up to 100% Sangiovese), and can contain up to 25% uva complimentari, which can also include the traditional white grapes now prohibited in Chianti Classico, and also international varietals, with a provision that Cabernet (Franc, Sauvignon or both together) not exceed 10%. Winemakers are free to age the Vino D'annata, which is released the year following the harvest, as they prefer. The Riserva, released 2 years after the harvest, must instead spend at least 8 months in wood (small barrels, large casks, or a combination of the two as the winemaker prefers) and 4 months in bottle. Deep brick ruby with some almandine accents. The bouquet is vinous with warm balsamic accents and some leaf tobacco mingled with wet leaves and sour berry fruit, also balsamic acidity with decidedly leafy undertones. On the palate it's bright, with lively slightly leathery cherry fruit supported by balsamic acidity and smooth silky tannins that have a slight burr, and flow into a silky finish. Impressive, and proof that Chianti doesn't really end at the borders of the Chianti Classico region. The sort of wine one doesn't pour out at a tasting. Deep brick ruby with black reflections and cherry rim. The bouquet is fairly rich, with slightly candied cherry fruit supported by some bramble and underlying minerality with some herbal accents too. On the palate it's bright, with lively cherry fruit supported by brambly greenish accents and tannins that have a greenish burr and flow into a clean rather bitter greenish finish with some leafy underpinnings that rather long. It's interesting, and pleasant to drink in a rather scrappy key; I generally expect more fullness in Riserve, and the tannins here are such that it's not a wine to drink far from the table, but it will drink quite well with grilled meats or hearty roasts. Deep cherry ruby with black reflections and cherry rim. The bouquet is fairly intense, with jammy brambly berry fruit supported by some menthol and slight metallic hints. Bright and fresh, revolving more around bramble than fruit. On the palate it's fairly intense, with brambly berry fruit supported by some cedary accents and slight hazelnut warmth. Pleasant, and will drink quite well with foods -- it's scrappy enough that it won't drink well by itself, but will work very well with red meats. Lively cherry ruby with black reflections and cherry rim paling to white. The bouquet is brambly with cherry fruit supported by greenish vegetal accents and spice. Zesty and nice balance. On the palate it's bright, with lively cherry fruit supported by smooth tannins that do have a slight burr, and by greenish acidity that flows into a warm sour cherry finish with brambly vegetal underpinning. Quite pleasant, and will drink very well with foods. A wine that will drink very well with foods, and you will want more of. Deep cherry ruby with cherry rim. The bouquet is powerful and quite fresh, with bright floral accents that are a little more than I would have expected from a 2008, but pleasant, and supported by spice and deft oak as well. Pleasant in an international key, and opulent. On the palate it's rich, with powerful cherry plum fruit supported by moderate acidity, and by tannins that have a distinct cedary underpinning, and flows into a warm cedar laced finish. It's still a little young, but pleasant in a soft seductive key, and if you like this style you will enjoy it. If you prefer wines with less oak, it won't work as well for you. Deep cherry ruby with cherry rim -- it's almost poured ink. The bouquet is fresh, with cherry and slight candied cherry accents mingled with some menthol and slight gum Arabic as well. A bit blocky, and gives an impression of more power than definition. On the palate it's bright, with fresh warm cherry fruit supported by more acidity than I expected from the nose, and by tannins that are smooth and soft, with a slight burr that provides definition. The nose needs a little time to catch up with the palate, but it does display pleasing grace, and will work very well with food. It surprised me. Pale almandine with black reflections and almandine rim. The bouquet is fairly intense, with brambly notes, some greenish accents and Mediterranean scrub forest, mingled with peppery spice and deft cherry fruit. Austere, and takes its distance from us, but has quite a bit to say. On the palate it's deft, with bright sour cherry fruit supported by tannins that are brambly and slightly greenish, and supported by pleasant brambly acidity that flows into a long tart finish. It's pleasant in a rather scrappy key, and will drink very well with grilled meats or roasts; it's quiet approachable in a traditional key, and if you like the style you will enjoy overtones. A pleasant surprise for me. Deep black cherry with black reflections and almandine rim paling to orange. The bouquet is a bit musty, with berry fruit mingled with some wet leaves and some camphor with yellow peaches, which can occur in red wines too. It's not quite as clean as I might have hoped. On the palate it's medium bodied with bright cherry fruit supported by savory notes and tannins that are smooth and have a slight burr, and flow into a rather dry tannic finish with lasting bitterness. I'd have liked a little more definition and richness to the fruit. Deep cherry ruby with black reflections and cherry rim. The bouquet is intense, and decidedly brambly with greenish accents and some grilled more friarelli than bell pepper and some wet paper. On the palate it's medium bodied, with fairly bright cherry fruit supported by brambly greenish tannins that have a pronounced rather dry burr, and flow into a long decidedly tannic finish. It's quite dry, and is a wine that will work well with foods, if you like this style. If you like smoother fruit driven wines it won't work as well for you. Lively cherry ruby with black reflections and cherry rim. The bouquet is fairly intense, with brambly notes and some vegetal accents and some spice as well. Not much fruit. On the palate it's bright, with lively cherry fruit supported by alcohol and warmth, and by bright acidity and tannins that have a greenish brambly burr and flow into a clean bright finish with lasting sour cherry and raspberry acidity. Zesty and will work well with grilled meats or light stews, and will age well for a number of years; the nose needs another year to come together. Almandine with black reflections and cherry rim. The bouquet is fairly intense, with cherry fruit supported by spice and some sandalwood, and by some vegetal accents. Quite pleasant in a spicy modern key. On the palate it's light, with moderately intense berry fruit supported by greenish tannins that have a cedary underpinning that flows into lasting bitterness. I'd have liked a little more definition and richness to the fruit, which is more brambly than really ripe. Deep black cherry ruby with black reflections and cherry rim. The bouquet is fairly intense, with brambly vegetal accents mingled with berry fruit and spice, in particular cumin and sea salt Nice depth. On the palate it's bright, with lively cherry fruit supported by lemony acidity and tannins that are smooth and have a slight burr, and flow into a clean fairly tart sour berry fruit finish. It's pleasant in a slightly scrappy fairly traditional key, and will work quite well with foods, in particular, grilled meats or roasts. It would be perfect with a grigliata mista, mixed grilled meats. Lively cherry ruby with black reflections. The bouquet is light, with brambly accents and some vegetal notes, supported by spice and alcohol. Not much fruit, but there is sea salt and pepper. On the palate it's bright, with sour cherry fruit supported by brambly acidity and tannins that are slightly greenish and have a bright burr, and flow into a rather tannic finish with bitter underpinning.. A scrappy food wine that will support what it's served with, without demanding center stage. Deep black cherry ruby with black reflections and cherry rim. The bouquet is fairly rich, with berry fruit mingled with some minerality and some graphite shavings with hints of white mushrooms as well, and some spice. On the palate it's light and fairly direct, with tart berry fruit supported by tannins that are rather light, smooth, and bitter, and flow into a clean bitter finish. Direct and up front, it's a food wine that will support what it's served with, without hogging the limelight. Deep black cherry ruby with brilliant reflections. The bouquet is bright, with lively berry fruit supported by some vegetal accents and clean greenish spice, in particular cumin and hints of mace, and also some menthol Pleasant. On the palate it's bright, with lively sour cherry fruit supported by tannins that have a slight burr and bright sour berry fruit acidity that flows into a clean rather tannic finish with dry peppery accents. Quite drinkable, and will work well with foods. Lively cherry ruby with black reflections and cherry rim. The bouquet is fresh and fairly vegetal, with spice and some graphite shaving mingled with savory notes and underlying red berry fruit, also a fair amount of alcohol. On the palate it's light, with moderately intense berry fruit supported by moderate fairly mineral acidity, and by tannins that are smooth and rather glancing, and flow into a rather mineral finish. I'd have liked a little more richness to the fruit. Deep black almandine with black reflections and almandine rim. The bouquet is fairly rich, with cherry fruit supported by bramble and spice with some greenish vegetal accents and some underlying sea salt and warmth, also some alcohol. On the palate it's bright, with lively sour cherry fruit supported by greenish brambly tannins and bright mineral acidity that flow into a fairly long bitter finish with a rough peppery burr. The Italian would be Ruvido, or Scrappy, and it will drink very well with grilled meats or fried foods, also with pasta dishes. In short, Versatile. Lively cherry ruby with black reflections and pink rim. The nose is frankly rustic, with wet stable straw and balsamic nose supported by penetrating rather balsamic acidity and some metallic accents. On the palate it's medium bodied tending towards light, with bright sour berry fruit supported by considerable acidity and some hazelnut accents, and by tannins that have a peppery burr that continues at length. If you like the style you will enjoy it, but you have to like fairly rustic wines that have some bite to them. Montalpruno Le Fontanelle Chianti Colli Senesi 2009 Lively black cherry with black reflections and cherry rim. The bouquet is fresh, with vegetal accents and alcohol mingled with some greenish notes and sea salt, and underlying red berry fruit. Bright, and gives an impression of lightness. On the palate it's bright, with fresh sour cherry fruit supported by graphite bitterness and alcoholic warmth that flow into a fairly bright sour berry fruit finish. It's a classic food wine, one that one can set out and will go quickly, and pleasant in a direct up front sort of way. Brash. Lively cherry ruby with bright reflections and cherry rim. The bouquet is bright, with greenish vegetal notes and brambles supported by red berry fruit and some spice, supported by a fair amount of alcohol as well. Fresh. On the palate it's bright, with fresh sour cherry fruit supported by sour cherry acidity and tannins that are smooth, though they do have a slight greenish burr that is both youthful and helps provide definition. Pleasant, in a bright fresh key, and will drink quite well with simple grilled meats or stews, and also has the acidity necessary to work well with fried foods. Will go quickly. Deep cherry ruby with black reflections and cherry rim. The bouquet is fresh, with moderate berry fruit supported by vegetal accents and some cedar, and by spice and alcohol as well. There may be fruit, but it's covered by the other elements. On the palate it's medium bodied, with moderately intense berry fruit supported by some acidity, and by tannins that have a milky feel to them that is likely wood fruit interaction, and flow into a rather bitter finish with lasting acidic warmth. Lively cherry ruby with black reflections and cherry rim. The bouquet is bright and fresh, with berry fruit supported by some greenish accents that bring to mind bean shells (from cannelloni beans) and some spice as well. Pleasant in a fresh lively key. On the palate it's fairly light, with moderately intense sour cherry fruit supported by acidity and considerable warmth, while the tannins are ample and smooth but not quite as well defined as I might have liked them to be. It's a bit soft. Deep slightly violet cherry with cherry rim. The bouquet is spicy, with nutmeg and ceda rmingled with some brambles and vegetal accents, also some incense and hints of beeswax. A bit unusual. On the palate it's medium bodied tending towards light, with moderately intense fruit supported by savory minerality that carries the wine, and flow sinto a savory rather peppery finish while the tannins contribute a lengthy burr to the mix. Quite direct, and will drink well with simple foods. Deep black cherry ruby with black reflections and cherry rim. The bouquet is fresh, with red berry fruit supported by pleasant greenish vegetal accents and spice, with some graphite shavings and pleasant brambly notes. On the palate it's bright, with lively cherry fruit supported by sour berry fruit acidity and some dusky notes in the tannins, which flow into lasting warmth. Tart in a rather cheeky key, and will drink quite well with grilled meats or light stews, and also has the acidity necessary to work well with fried meats and vegetables. Lively cherry ruby with black reflections and cherry rim. The bouquet is fairly aggressive, with red berry fruit supported by brambly vegetal accents and spice, and by the heather of a Tuscan field in summer. On the palate it's medium bodied, with fairly bright cherry fruit supported by greenish vegetal accents and peppery spice that flow into a clean bright sour berry fruit finish. Quite direct, and will work well with simple foods. Expect it to go quickly. Pale cherry ruby with black reflections and cherry rim. The bouquet is fresh, with cherry fruit supported by some savory accents and slight berry fruit spice, with some alcoholic warmth as well. On the palate it's bright, with lively sour cherry fruit supported by smooth bright berry fruit acidity and tannins that are smooth and slightly greenish, flowing into a clean bright berry fruit finish. Pleasant, in a light scrappy key, and will drink quite well with simple grilled meats -- lamb chops come to mid -- or light stews, and also has the acidity necessary to balance fried meats and vegetables. Lively cherry ruby with black reflections and cherry rim. The bouquet is fairly rich, with chewy cherry fruit that has slight candied cherry overtones, and is supported by greenish vegetal accents and moderate spice, with some menthol too. Fresh, in a slightly riper key. On the palate it's smooth and quite soft, with fairly rich cherry fruit that gains definition from moderate berry fruit acidity, and is supported by tannins that are quite round and quite smooth. It's more approachable than some, and the sort of wine one could drink by the glass at a wine bar, but doesn't have as much of a tannic bite to it as many of the Chianti Colli Senesi wines tasted. If you like this softer smoother key you will enjoy it considerably, but if you prefer a little more backbone you may find it wanting. The Italian that comes to mind is ruffiano, ingratiating. Lively cherry ruby with violet accents and white rim. The bouquet is bright and fresh, with lively vegetal and mentholated accents mingled with berry fruit and heather. Quite approachable in a fresh young key. On the palate it's bright, with lively cherry fruit supported by deft berry fruit acidity that has some greenish accents, and by tannins that have a slight peppery burr and flow into a clean sour cherry finish with tannic underpinning. Pleasant and quite approachable; it will work very well with foods, supporting without demanding attention, and will go quickly. Expect to want a second bottle. Lively cherry ruby with black reflections and white rim. The bouquet is fresh, with berry fruit and mentholated spice with some brambly accents. On the palate it's up front, with bright cherry fruit that is supported by clean bright berry fruit acidity and slight tannins that flow into a finish that gains slightly cooked berry fruit overtones as the other elements fade. Quite simple, a wine that one puts out and drinks. The Italian descriptor would be Beverino, quaffing. A touch more tannic bitterness and a touch less fruit than the Geografico. Expect it to go quickly. My first visits to wineries (many years ago) were in the course of preparing travel articles, and it only took me a couple of stops to realize how little I knew. So I went to the now long-gone Libreria Marzocco and bought the Italian translation of Rosemary George's Chianti and the Wines of Tuscany, which covers the various appellations thoroughly and also has quite a bit about the individual winemakers. One of the people she referred to often was Norman Bain, the Scott who owned Le Masse Di San Leolino, not far from Panzano, and while ease of communication was likely one of the reasons she talked to him, his philosophy was likely another. Simply put, he wanted nothing to do with the Supertuscans that were all the rage then, and firmly believed a winery in Chianti should make Chianti. Shortly after the war he was brought the wrong bottle of wine at a restaurant, and sent it back. The sommelier brought another bottle, wrapped in a cloth, and it was not what he had ordered either. When this happened a third time, Mr. Bain summoned the maitre: The dinner was free, and his love of wine was born. After managing Shell Italia, and eventually "selling the company because we couldn't make any profits with the prices being controlled by government," he bought Le Masse di San Leolino in 1972. "Saw the place at dusk on a Saturday" he recalls, "and drove down to Forte dei Marmi to make the down-payment the next morning." He admits to having had second thoughts when he saw the place in the light of day, but rolled up his sleeves and got to work; it's marvelous now. What led you to Tuscany? "The region's history - it's the land of the Renaissance, and its attractions on the culture side - a combination of things. I especially liked what it had to offer in the way of the culture, though I hate to use that word because it's very much bastardized." Why did you decide to take up wine making? "I think I told you the story of the restaurant - People always ask that question. Sometimes I start thinking "Why the hell et cetera et cetera? I cannot think of any other reason whatsoever. I suppose I love the country and - well - this country. The country per se I'm very fond of - I'm not a city man." Has wine making turned out to be what you expected? "In many ways yes. I would say there are two main, well, complaints if I may use the expression. One is the extraordinary amount of bureaucracy that has crept in in the last years. Frankly had I known when I put the new vineyard in - I bought this property in 72 and put in a new vineyard in 73, and had I known then what the situation would be today I would have put in about 20 rows of grapes for me and for my friends and (claps hands). Because it is frustrating - very frustrating." "Ah well. Firstly, just working in the country. I'm a country boy at heart. And secondly the fascination with the whole process of making wine - and olive oil for that matter. It is, to use that horribly overused word, challenging, and I need that to keep me on my toes. I don't like the easy life very much. Or not yet - as I get older... "There are so many things to learn, because it's a very delicate process to make a really good wine. You have to be dedicated, and give it passione, as they say. Oh, I mean about being out in the open air, all the things about living in the country, working in the country - they're all part of the package, to answer your question. The wine-making itself is great fun. " "And I've got all a man living in the country should have - waking up with skylarks and nightingales singing away. The roe deer have been a bit of a problem - they've become terribly tame, they're actually domesticated. They're beautiful creatures. I'll never forget one evening , well not quite dusk - I normally walk about enjoying the twilight though it's very short in these parts - I'd just gone out, and there were two females nibbling away at a couple of dwarf cypresses. They saw me before I walked over - and then - just walked very quietly away." If you had to start over, what would you change? "Well one fundamental thing, I think -- I said about 20 rows - I'd make an even smaller vineyard, just to make wine for myself and my family. That would be fundamental. I can't think of anything else, because the bureaucracy is there, and you can't change that." What advice for someone who wanted to make wine? "I'd tell them to think about it very carefully indeed, and to make sure they have the financial assets to do a proper job. Quite expensive nowadays. Very many questions to be answered if you're thinking of going into the wine business - you're not thinking of...?" Not right now, but there's no telling what the future could hold. "That's very true, very true. I never thought I'd be making wine." A couple more questions: How does Tuscany differ from Scotland? "Depends very much on what you're talking about - culture, scenery, food, people, not to forget history." "How would I put it? Tuscany is a bit like Scotland, in that there are many regions. A Lucchese differs form a Florentine or a Sienese, just as Highlanders differ from Lowlanders or those of the big cities. There are very strong regional differences." What do you miss most about Scotland, or do you? "Very much so, despite the fact that I left it in 1949 to begin my travels. One thing I don't miss is the climate; the main things I do miss are the scenery and the hospitality of the Highlands from which I came. He hesitated. "I've been very fortunate." I interviewed Norman in the early 1990s, and though we did speak occasionally then we lost track of each other. When I decided to reprint the interview I tried to look him up, and discovered that he passed away a few years ago. Le Masse di San Leolino went to a niece, who sold it to a Dutch family. Nobody was home when I drove by, but it's still beautiful. This spring the IGP Group -- Carlo Macchi, Luciano Pignataro, Stefano Tesi, Roberto Giuliani and I (youll find links to their sites on the side bar) -- asked Marinella Minetti, who runs Wellcom, an astonishingly competent PR firm in Alba, to gather samples of the current vintages of Barbaresco (the 2008 vintage) and Barolo (the 2007) for us to taste. She did, and this October we drove up and tasted them over the space of several days, in the company of Pasquale Porcelli, who tastes with Carlo for Winesurf. It was a spectacular week, with the only wrinkle being that Roberto came down with the Flu and was unable to come. At the end of each tasting session -- they were blind, and held in the mornings -- we talked together and selected the wines that we all found noteworthy, posting them as IGP selections on our sites. What we do with our tasting notes is up to each of us, and I am posting them here, indicating which wines were IGP selections, and scoring all of the wines as I normally do. You will note that some I scored highly didn't make the cut, but this is what happens when a panel tastes -- everyone has to be impressed by a wine or it doesn't make it. Before getting to the wines, a word on the wine and the vintage. Barbaresco is one of the great Piemontese red wines, and is produced from Nebbiolo grapes grown in the communes of Neive, Barbaresco and Treiso (and, to a tiny degree, Alba), all of which are located on the right bank of the Tanaro river downstream from Alba. The 2008 vintage is not of as uniform quality as some other recent vintages have been. Though there were some exceptions, I found that in general the wines from the Communes of Barbaresco and Treiso showed significantly better than those from Neive, with nice fruit and bracing acidity in a variety of styles; as always, you'll have to match the wines to your tastes but there are many fine bottles to be had. Neive's wine is instead more uneven. Deep cherry ruby with garnet reflections. The bouquet has fresh berry fruit mingled with cherries, some iodine, and roses, supported by raspberry acidity, some graphite shavings and brambles. Nice balance. On the palate it's bright, with rich cherry fruit supported by lively acidity and brambly tannins with a warm burr. Nice depth, and bright with considerable finesse; it will become elegant in an ethereal key and be long lived. Deep cherry ruby with black reflections. The bouquet is vinous, with cedar, some sweetness, chocolate, and camphor but not much fruit. On the palate it's ample, with moderate bitter fruit, some greenish cedar, moderate acidity, tannins that are cedar laced and somewhat lumbering, and a bitter chocolate-laced finish. Lively garnet ruby with brilliant reflections. The bouquet is closed, though swishing brings up some cedar, slight vinous notes, hints of mint and bramble, and some alcohol, which increase in intensity as it opens. Not much fruit. On the palate it's pleasant, with bright berry fruit supported by acidity, slight greenish accents, and bitter splintery tannins that flow into a long splintery finish with bitter accents and sour berry fruit. Needs time for the nose to develop and the tannins to smooth. Deep cherry ruby, darker than others. The nose has berry fruit, some sea salt, slight balsam, slight leaf tobacco, alcohol, moderate spice, and some truffles; there's not much fruit. On the palate it's bright, with sour cherry fruit and bitter accents, there's a considerable burr to the tannins, which flow into a long dry splintery tannic finish with graphite shaving bitterness and greenish accents. I found it a little tired, though this is also its being very young and disjointed. It needs at least a year to begin to come together. Deep cherry ruby with black reflections. The bouquet is moderately intense, with moderate berry fruit, some spice, slight alcohol, some rosa canina, some balsamic notes, and slight tar with hints of leaf tobacco. On the palate it's ample, fairly soft, fairly rich, with moderate fruit and a bitter underpinning. Pale almandine ruby with black reflections. The bouquet is closed, cool, and somewhat musty, with alcohol, spice, greenish accents, sea salt, bitterness, and some cedary bramble. On the palate it's moderately intense with sour berry fruit, some metallic notes, hot iron, and moderate acidity; the tannins are fairly bright, with a burr, while the finish has berry fruit and hot iron. Deep cherry ruby with black reflections and almandine rim. The bouquet is closed, though swishing brings some fruit, cherries, rosa canina, slight camphor, leaf tobacco, slight cedar, and spice; it's quite young. On the palate it's pleasant, with bright berry fruit supported by berry fruit acidity and tannins that have graphite shaving bitterness and a cedary underpinning, and flow into a clean rather bitter finish with a graphite shaving burr. Pleasant in modern key, needs time. Almandine with black reflections and almandine rim. The bouquet is muted, with some berry fruit supported by acidity, cherry fruit, and brambles. I found it somewhat non-descript. On the palate it's bright, moderately intense, with cherry fruit supported by berry fruit acidity and by tannins that are moderately intense and have a slight burr, flowing into a fairly long bitter finish. It's pleasant, but doesn't really enthuse me. Pale cherry ruby with almandine reflections and almandine rim. The bouquet is moderately intense, with white truffles, minerality, some jammy fruit, iodine, and mustiness that brings to mind wet paper. On the palate it's ample, and rather lax, with fairly bright sour cherry fruit supported by graphite shaving laced bitter acidity and by tannins ample and smooth, savory, and flow into a savory finish. It could be tighter. Deep almandine ruby with black reflections. The bouquet is dusky, with cedar, pungency, some alcohol, moderate berry fruit that ahs some leaf tobacco accents, and spice. On the palate it's moderately intense, with moderate sour berry fruit supported by greenish accents, minerality, and splintery greenish tannins with an underlying bitterness that flow into a greenish finish. Needs time, but will always have a rather greenish thin feel, I think. Deep black cherry with almandine reflections, almandine rim. The bouquet is powerful, and green, with graphite shaving and bitterness, alcohol, savory notes, and some spice but not much fruit. On the palate it's ample, and fairly sweet, with sweetish berry fruit supported by graphite shaving bitterness and dry tannins, spice, slight earthiness, and a long bitter finish. Graphite in a glass. Deep almandine with ruby reflections, almandine rim. The nose is rustic, with balsam, stable straw, lathered horse, greenish notes, stable muck. On the palate it's moderately full, with bright, sour cherry fruit with bitter tannins; the finish reflects nose with bitter animal accents. Far into rustic, and a wine you should only consider if you like style. Almandine with black reflections and almandine rim. The bouquet is closed, though swishing brings up some jammy notes, berry fruit, fig Newton, spice, and slight tar. On the palate it's fairly light, with sour cherry fruit supported by bright berry fruit acidity and dusky tannins that flow into a clean sour finish. Pleasant in a lighter key, will be ethereal with time. Deep cherry ruby with black reflections, cherry rim. The bouquet is closed, with some wet paper, slight graphite some savory bitterness. Needs time. On the palate it's savory with moderately intense berry fruit, sour berry fruit acidity, and splintery tannins that flow into a bitter finish. Deep cherry ruby with black reflections and cherry rim. The bouquet is oaky, with considerable cedar, some bitterness, chocolate, cocoa, and some berry fruit. On the palate it's pleasant, with fairly bright cherry fruit supported by cocoay tannins. Nice in an international key; a fellow taster says it's the "Banfization of Barbaresco." Deep black almandine with black reflections and almandine rim. Muted bouquet, with some berry fruit and bitter accents, and as one swishes some greenish accents, minerality, and alcohol, but not much fruit. On the palate it's nondescript, with moderate fruit, supported by mineral acidity and smooth tannins that do have a slight splintery burr, and flow into a bitter finish. I found it lacking in brightness of fruit and richness, and a bit dry. Almandine with black reflections and almandine rim. The nose is musty; a fellow taster finds anchovies, while I find some balsam, some warmth, and slight stable straw. On the palate it's moderately intense, with bitterness and some berry fruit supported by fairly bitter tannins that flow into a graphite shaving laced bitter finish. I found it lacking fruit. Black almandine with ruby reflections, almandine rim. The bouquet opens with cedar, dusky accents, spice, dried orange peel and savory notes; there's also alcohol, and it's slightly pungent. On the palate it's ample, softer than expected, and fairly bright with sour cherry fruit supported by raspberry acidity and tannins that are quite dry, flowing into a sour slightly mineral finish with acidity and some quinine bitterness. There's a disconnect between nose and palate; it needs a year or two to decided what it's doing. Fairly direct in any case, but could go places. Deep black cherry ruby with black reflections, cherry rim to almandine. The bouquet is oaky, with cedar and spice overshadowing fruit, but nicely done in international key. On the palate it's ample and smooth, with fairly rich cherry plum fruit supported by moderate acidity, plums, and tannins that have chocolaty accents and flow into a smooth chocolate and cold coffee finish. Very international, and a wine you should consider if you like the style. Deep black cherry with black reflections and cherry rim paling to almandine. The bouquet is dusky, with cedar, sea salt, greenish accents, spice, and slightly bitter savory notes but not much fruit. On the palate it's ample and rather dusky, with moderate fruit supported by cedar bitterness and cocoa, flows into a cocoa laced rather bitter finish. Not bright, and the fruit lacks verve. Deep black almandine with black reflections, cherry rim. The bouquet opens with cedar, some spice, and moderate fruit, as it opens becomes berry fruit, while there are also graphite shaving bitterness, some spice, and licorice root. On the palate it's moderately intense, with minerality and sea salt supported by bitter tannins, graphite shavings and some underbrush with licorice root accents. A very mineral interpretation of Barbaresco, and a wine to consider if you like the style. It grew on me. Deep almandine with black reflections and almandine rim. The bouquet is powerful, with fairly intense cedar, spice, some licorice root, bitter accents, and slight pungency, but not much fruit. On the palate it's full, with bright, rich cherry fruit supported by berry fruit acidity and savory accents while the tannins are warm splintery, displaying nice depth, and flow into a long bright tannic finish. The nose is behind the palate, but there is nice potential, and it will reward those who give it time. Deep pigeon blood ruby with cherry rim. The bouquet is fairly intense, with balsamic notes, slight wet cardboard, spice, some large wood, dried orange peel, some bitterness, and dusky accents. On the palate it's ample, with moderate fruit cherry with some jammy plum accents, supported by moderate plum acidity and by smooth tannins that do have a slight greenish burr, and flow into a plum finish with hints of sweetness and lasting warmth. Deep pigeon blood ruby. The bouquet is closed; swishing brings up some graphite shavings and slight bitterness, but nothing else. On the palate it's brighter, with cherry fruit supported by greenish accents and spice, savory notes, and sweet tannins; the palate is more interesting than nose and I'd give the nose a while to get its act together. It's too young to say much about. Deep black cherry ruby. The bouquet is fairly rich, with cedar and cherry fruit supported by savory notes, some bitterness, sea salt, and greenish leaf tobacco accents. On the palate it's ample and soft with more bitter minerality than fruit; a fellow taster mutters about coconut, which I do find in the finish. Lacks fruit and richness. Deep almandine with almandine rim. The bouquet is fairly rich, with cherry fruit and some rosa canina, chocolate, slight cedar; as it opens rich, and rather swanky berry fruit emerges with some savory notes. Quite modern in style. On the palate it's pleasant, with rich cherry fruit supported by sour raspberry fruit acidity and smooth savory tannins with pleasant mineral accents that do have a youthful burr, and flow into a clean savory finish. Pleasant in international key, and you'll like it if you like the style. Deep black almandine with black reflections. The bouquet is fairly intense, with a lot of wood; it opens with cedar and dusky accents followed by spice, bitterness, menthol, and graphite shavings. Again, oak. On the palate it's ample and smooth, with moderate berry fruit supported by well-polished tannins and savory mineral acidity that flow into a clean savory finish with dry tannic underpinning. A lot of oak, that the fruit does (barely) digest; it's quite international in style and more extreme than may international wines now are. Pale almandine with black reflections almandine rim paling to orange. The bouquet has iodine, bitterness, and rosa canina, displaying nice depth in a rather essential key, and promises ethereality. On the palate it's medium bodied, with bright berry fruit supported by minerality, some sour berry fruit acidity, and iodine, while the tannins are fairly smooth and savory, with a flight burr, and flow into a long mineral finish. It's fairly traditional, and a wine to seek out if you like the style, which is austere, privileging finesse over power. It will be long lived. Lively cherry ruby with cherry rim. The bouquet is opens with bitterness, some cedar, leaf tobacco, bitter cocoa, and minerality, but not much fruit. On the palate it's bright with lively sour cherry fruit supported by bitter tannins sea salt, and bright berry fruit acidity. Pleasant in a powerful fairly traditional key, with an abundance of fruit and acidity that is still working at coming together. Expect it to go places. Pyrope with almandine rim. The bouquet is quite ripe, with prunes, plums, spice, and gum Arabic. On the palate it's ample and fairly bright, with sour plum fruit laced with greenish accents and supported by moderate acidity and dry tannins with a greenish underpinning and some savory notes. Deep black almandine with black reflections almandine rim. The bouquet pungent, with greenish accents, spice, slight shellac, and some gum Arabic. On the palate it's better, but not great, with berry fruit supported by sour accents and spice, while the tannins are bitter, and the finish rather green and rather savory. Almandine with black reflections almandine rim. The bouquet is fairly intense, with leaf tobacco, hints of shellac, bitterness, dry leaves, savory accents, and a fair amount of alcohol, Not much fruit. On the palate it's fresh and bright, with fairly rich berry fruit supported by leafy minerality that brings an oak forest to mind, and rather light tannins with youthful splinteriness. Pleasant finish with warm sour cherry acidity and mineral accents. Will be ethereal. Deep almandine with black reflections. The bouquet is savory, with slight bitterness, green leather, leaf tobacco, and some spice, but not much fruit. On the palate I found it to be nondescript; there is moderate fruit, supported by savory notes, moderate mineral acidity, some spice, and fairly smooth full tannins that flow into a bitter finish. I'd have liked greater richness to the fruit. Deep pale almandine ruby brilliant reflections almandine rim. The bouquet is funky, with wet horse, bitter accents, balsam, stable straw, and some fairly sweet berry fruit; it's unsettled and going in several directions. On the palate it's fairly bright, with lively balsam laced cherry fruit supported by greenish accents; the tannins are bitter and slightly balsamic, and flow into balsam laced finish. Traditional in style, and the palate grew upon me. Almandine with black reflections, almandine rim. The bouquet is oak in a glass, with cedar, minerality, some candied accents, and spice; very international. On the palate it's fairly bright, sour cherry fruit supported by bitter tannins that have a cedar underpinning and flow into a slightly green cedary finish. The palate is better than the nose, but very international, and you should only consider it if you like this style. Deep black cherry ruby with black reflections, cherry rim. The bouquet is rich, with berry fruit, some truffles, jammy accents, some spice, and plum fruit; it's fairly charged in a ripe key, and as it opens further greenish mineral accents and some leaf tobacco also emerge. On the palate it's ample and smooth, with ripe sour berry fruit supported by bight berry fruit acidity; the tannins are smooth with a slight burr, and flow into a warm sour finish with leaf tobacco underpinning and lasting warmth. Very young and needs time. Deep pigeon blood ruby with almandine rim. The bouquet is greenish, with some licorice root and rhubarb, slightly spiky minerality, wood smoke, and as it opens some stable straw. On the palate it's ample with fairly rich fruit, and fairly soft, with moderate citric mineral acidity and tannins that are fairly smooth, with a slight burr. I'd have liked more depth. Lively ruby with black reflections. The bouquet is powerful and unusual, a sweaty redhead on a hot day, animal, with some dried orange peel spice. Particular and takes no quarter. The palate reflects nose, with bright sour berry fruit supported by savory accents and smooth tannins that flow into a savory finish with greenish accents and, again, that redhead. The aromas are still in youth, and she may fade with time, but it is a wine in a style you have to like. Deep pyrope with black reflections and almandine rim paling to orange. The bouquet is cooked, with jammy accents, prunes, and some savory spice, but mostly cooked. On the palate it's ample and soft, with jammy cherry plum fruit supported by warmth and some greenish accents, and by tannins that are rather dry and slightly greenish. Deep cherry ruby with black reflections almandine rim. The bouquet is moderately intense, with acidity, greenish notes, pungency, leather, some minerality, leaf tobacco, some cedar, and not much fruit. On the palate it's softer than expected, with moderate fruit supported by considerable minerality and cedar-laced tannins with a splintery burr, flowing into hazelnut skins in finish, which is splintery and mineral with some cedar. Lacking in richness of fruit. Deep almandine with black reflections and almandine rim. The bouquet is a bit rustic, with berry fruit and greenish accents, floral notes, menthol, cedar, balsamic accents, and some wet leaves. Savory notes too as it opens. On the palate it's bright, peppery even, and more mineral than fruit driven, with considerable bitter savory notes, peppery tannins, some mineral acidity, which flow into a rather bitter mineral finish with iodine and India ink bitterness. It's a bit garrulous. Deep black almandine with black reflections. The bouquet is moderately intense, with green leather, brambles and some leaf tobacco, but not much fruit. On the palate it's ample and savory with moderate fruit and savory tannins supported by sour berry fruit acidity with some greenish accents, which flows into a slightly splintery finish. Black almandine with black reflections. The nose is a bit rustic, with moderate fruit supported by sweat, green leather, greenish vegetal accents, cooked chicory, and some mineral accents with slight hints of petroleum. On the palate it's brighter, with sour berry fruit supported by savory notes that do reveal some sweaty accents, and by tannins that are fairly smooth, though they do reveal some splintery youth in the finish. Deep almandine with black reflections. The bouquet is somewhat cooked, with sugary jammy berry fruit supported by greenish accents, spice and some melon rind. The palate is moderately intense, with sour cherry fruit supported by acidity, some savory notes, and tannins that are deft and rather savory, flowing into a savory finish. It's in mid stride and needs time, though it is rising. Deep almandine with almandine rim. The bouquet is moderately intense, with brambly berry fruit with some acidity, alcohol, some greenish notes, spice, and moderate fruit. On the palate it's fairly bright, with lively cherry fruit supported by berry fruit acidity and tannins that have a cedary underpinning, flowing into a clean tannic finish with cedar underlying the wine. More brightness and perk would have been nice. Deep almandine with black reflections almandine rim. The bouquet is fairly rustic, and animal, with some balsamic accents, wet stable straw, some minerality, slight graphite, acidity, and alcohol. Nice balance in a quite traditional key. On the palate it's bright, with fairly lively mineral berry fruit supported by minerality and splintery tannins that have slight greenish accents, and flow into a mineral finish with tannic accents and some leaf tobacco. If you like the style, which is traditional, you will enjoy it, and can also expect it to age nicely too. Deep black almandine with black reflections and almandine rim. The bouquet is fairly intense, with leaf tobacco and minerality, some spice, some greenish accents, slight pungency, and slight goudron; there's nice depth in an ethereal key. On the palate it's ample and bitter, with minerality and leaf tobacco supporting wet leaves and mineral acidity, while the tannins are fairly smooth though they do display a youthful splinteryness. Pleasant though not fruity, revolves more around minerality. Deep black almandine with black reflections and almandine rim. The bouquet is oaky, with spice and cedar supported by greenish accents, leaf tobacco, and some greenish accents. On the palate it's full, with fairly rich berry fruit supported by tannins that are savory and cedar laced, flow into a clean cedar laced finish with fruity underpinning. The palate is better than the nose, with pleasant fruit, and needs a year or two to come together; if the nose follows it it will be pleasant in a modern key. Deep cherry ruby. Closed nose, with swishing reveals some spice and a little cedar, and slight wood smoke, but not much fruit. The palate is decidedly mineral, with minerality overshadowing fruit, much to the delight of a fellow taster (I found that it brings to mind certain Lagreins). If you like the style you will enjoy it. Deep pigeon blood ruby with black reflections. Intense nose, with iodine and dried porcini, considerable graphite shavings, some bitterness, and road tar on a cool day. On the palate it's ample, with considerable bitterness, moderate fruit, and rather dry tannins that flow into a greenish wet leaf finish; there's something of an oak forest to it. Deep black cherry with black reflections, pyrope in rim. The bouquet is dusky, and rather pungent, with some animal aromas, slight cow flop, spice. On the palate it's a bit brighter, with sour cherry fruit supported by berry fruit and savory accents and some bitterness, and considerable minerality, which I might have liked more fruit to balance. The tannins are dry and flow into a dry tannic finish. It's still coming together, and very much in mid-stride; the score reflects this. Deep black cherry ruby with black reflections, some almandine in the rim. The bouquet is moderately intense, and smoky, with some spice On the palate it's fairly rich, with cherry fruit supported by graphite shaving bitterness, and spicy rather bitter tannins, and flows into a bitter finish. A very mineral wine, and though I was telling myself it wasn't impressive I found myself giving it a good score. Go Figure. Almandine with black reflections and almandine rim. The bouquet is muted, though swishing brings up some berry fruit and some alcohol supported by some alcohol and some oak; there's not much definition. On the palate it's ample, with brighter than expected berry fruit supported by moderate acidity and splintery tannins. Deep almandine with black reflections and almandine rim. The bouquet is quite oaky, with greenish accents and leaf tobacco, considerable cedar, and some spice; it smells like a wet barrel slat. On the palate it's brighter than the nose suggests, with lively greenish berry fruit supported by sour greenish acidity and by tannins that are greenish and cedar laced, flowing into a decidedly tannic finish. If you like oaky wines you will enjoy it, and it also has good aging potential. Almandine with black reflections and almandine rim The bouquet is greenish, with spice, savory notes, and acidity, and as it opens some pungent berry fruit and tartness. On the palate it's moderately intense, with bitterness and moderate acidity supported by minerality and tannins flowing into a long dry, bitter tannic finish. Almandine with ruby reflections almandine rim. The bouquet is elegant, with rosa cainina, berry fruit, spice, herbal accents, slight cedar; it's quite deft and eminently inviting. On the palate it's full, with rich cherry fruit supported by lively berry fruit acidity, tannins that are smooth but display a slight greenish burr, and flow into a warm long berry fruit finish with a sour slightly tannic underpinning. Quite pleasant, and has a great deal to say. Deep almandine with black reflections almandine rim. The bouquet is elegant, opening with violets, some spice, and menthol; it displays nice depth and elegance and is pleasing. On the palate it's ample, with bright berry fruit supported by plum sweetness -- it's somewhat riper than some of the wines -- with smooth sweet tannins supported by minerality and graphite shaving bitterness, and flowing into a clean rather bitter finish .Nice depth and elegance. Deep pyrope with black reflections. The bouquet is muted, though swishing brings up some berry fruit, considerable alcohol, some acidity, and brambly notes. On the palate it's ripe, with cherry plum fruit supported by quite a bit of alcohol and moderate acidity. A bit thin, and alcohol carries the show. Almandine with black reflections and almandine rim. The bouquet is moderately intense and elegant, with vegetal notes, greenish accents, brambles, and some spice, elegance that also emerges on the palate, with deft berry fruit supported by clean sour berry fruit acidity and smooth sweet tannins. It's graceful, revolving more around elegance than finesse, and will become ethereal with time. Casting PC aside, it captures and distracts, rather like a pretty girl who causes heads to turn by just walking down the street. Deep black cherry ruby with black reflections and almandine rim. The bouquet is fairly rich, with berry fruit supported by some cedar and slight leathery accents . A bit rustic but pleasant. On the palate it's bright, with fairly rich cherry plum fruit, brisk green leather acidity with some leaf tobacco, a fair amount of alcohol, tannins that are smooth but greenish in youth and flow into a long clean bright berry fruit finish. Quite pleasant. Deep black cherry ruby with black reflections cherry rim. The bouquet is ripe and fairly international in style, with pleasant spice, cherry plum fruit with sweetish accents, and some cedar. On the palate it's quite ripe, with cherry plum fruit supported by alcohol, fairly brisk acidity, and smooth sweet tannins. Quite a bit going on, with nice depth and elegance. Deep black almandine with black reflections and almandine finish. The bouquet is pleasant in a fairly rustic key, with balsamic accents, wet stable straw, some greenish accents, balsamic notes, some berry fruit and sour berry fruit acidity, and balsamic acidity. On the palate it's pleasant in a traditional key, with moderately intense berry fruit supported by balsamic acidity and peppery tannins that flow into a clean decidedly tannic finish with peppery accents. If you like the style you will enjoy it, and it will age nicely too. Deep pigeon blood ruby with black reflections and almandine rim. The bouquet is fairly rich, with cherry plum fruit supported by some sweetness, jammy accents, some greenish brambly notes. On the palate it's bright, and ripe, cherry plum fruit supported by peppery tannins that have some greenish accents, and flow into a decidedly peppery finish with quite a bit of alcohol. Needs time, and is fairly aggressive; you will like it if you like the style, which does have oaky accents, but give it time. Deep black almandine with black reflections. almandine rim. The bouquet is fairly intense, with greenish accents, savory notes, sea salt, bramble, sunny accents, and sour berry fruit On the palate it's fairly bright, and savory, with moderate berry fruit supported by sour berry fruit acidity and greenish accents, while the finish is long and tannic. It is frankly behind at present, but with time will do interesting things. In short, a promise for the future. Deep black almandine with black reflections. The bouquet is fairly intense, and greenish with leaf tobacco and green leather, some salty tomato sauce, slight animal accents, wet stable straw, balsamic accents, and peppery spice. On the palate it's bright, with lively sour cherry fruit supported by deft slightly balsamic berry fruit acidity and tannins that have warm balsamic accents, and flow into a clean bright rather balsamic finish, It does have some rustic accents, and is a wine you will like if you like the style. Deep almandine with black reflections and almandine rim. The bouquet is moderately intense, and mineral with some cooked fruit accents and spice. Greenish. On the palate it's ample and fairly direct, moderately rich, with savory berry fruit and spice. Deep almandine with black reflections. The, bouquet is moderately intense, with greenish accents, spice, leather, and spice, but not much fruit. On the palate it's rather ripe, with bright berry fruit supported by ripe plum accents and spice; the tannins are quite dry, greenish, and flow into a dry tannic finish. Deep black almandine with black reflections and almandine rim. The bouquet is fairly rich, with bright berry fruit with jammy plum prune accents and some spice; it's pleasant in rich ripe key. On the palate it's ample, ripe and rich with powerful ripe fruit supported by smooth sweet tannins with slight berry fruit accents, tannins are a bit rich, and flow into a clean bright slightly splintery finish. Quite ripe, and you'll much enjoy it if you like the style. The last day of tasting in Wellcom's offices in Alba for the IGP team: 2007 Barolo from the Communes of Verduno and Serralunga, and a few Barolo and Barbaresco wines from older vintages. Just a few samples from Verduno, but high quality, with beautiful balance. Serralunga instead, as usual, is striking in its power, which in this vintage was -- in some wines -- accompanied by excessive alcohol and tannins that are quite rustic. Just some, many of the other Serralunga wines instead display the classic tightly woven Serralunghese "megatannins", and with them the sensation is one of almost velvety fullness and balance that continues almost infinitely. Once again, here are the wines that impressed us all; we all had to approve them, and therefore it just took one head shake for a wine to not make the list. When we publish our individual impressions, you will certainly find other wines that shine as well. The countryside, in rural areas too, changes so quickly that it becomes difficult to preserve it. Even so, it has been firmly established that "place identity" has a profound impact on people's psyches. Here are a few consideration, made while wandering the wine areas of the Langhe and Monferrato. Let's call them parallel convergences, or perhaps parallel coincidences. The crux of the matter is that this week, as I tasted wines with my IGP companions, I traveled the Langhe, at times admiring the spectacular vineyard draped slopes, whose vines looked like so many well-brushed green locks, monuments to monoculture, and the austere fortresses erected on the hilltops by the House of Savoy. The stuff of postcards, and you find yourself wondering how those funnel-shaped slopes manage to stand despite any traces of forest, with streets coming down straight like the spokes of a wheel: beautiful to look at but hydrogeological folly. And then you descend into the valleys: The plains vanish behind factories and warehouses, highways, and shops of all kinds, with scattered between them scraggly fields, what survives of poor agriculture that is also starting to return to the wild. A perfect example, you think, of an aesthetic and enogastronomic context whose excellence is not fully reflected by that of the container. Then you think some more, and remember that in your region, Tuscany, which certainly doesn't lack for similar scenes and excellences, people have had a lot to say about the countryside lately. Perhaps too much. We talk about local emergencies (day before yesterday in a Sienese paper: "Let's Save the Sienese countryside") and more national things (At Fiesole they discussed the countryside during a meeting dedicated to the birth of the Osservatorio sul Paesaggio), sometimes discuss the environment (often mistaken for the countryside), which people think should be the force behind (though nobody says how) "development" (discussed yesterday in Florence during a meeting on European cooperation), and of course say it needs to be protected and abuses halted. But the most interesting facet is another, which was discussed today at Lubec in Lucca, an international meeting on cultural heritage and the technologies it employs: what sorts of interferences are there, and are there relationships between the countryside people live in and their personalities? One can't help but wonder in a period of rapid change, both in time and in space, which can lead different contexts to be superimposed. At which point you are sandwiched between them. What is the real relationship, the experts wonder, between "place relationship" (which might better be called "genus lochi," the identity of the place, and "self identity?" "Living in the countryside of Chianti, the northwestern suburbs of Paris, or among the huge freeways of LA are not the same thing:" A statement of the obvious from Paolo Fuligni, psychologist, university professor and expert on urban ecologies, and also a moderator at the Lucca Meeting. "We must indeed keep in mind," he added, "that exposure to harmonious, pretty countrysides results in positive activities in important sections of the brain." It is on the basis of these statements that Mr. Fuligni and his assistants are attempting to make a map showing the characteristics of Italy's cities and countryside. 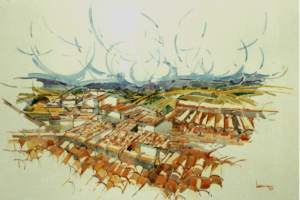 A long, complex task that is beginning in Tuscany and will continue to the other Regions. The only danger, we'd like to humbly suggest, is that by the time the project is completed the borders between town and country will have been eliminated, and people will thus travel among urban vineyards or cities with vines. 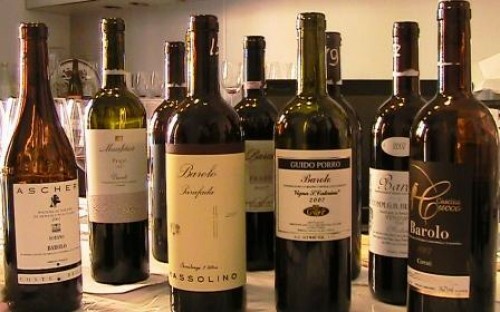 The third day of the Giovani Promettenti's tastings at Wellcom's offices in Alba opened with wines from the town of Barolo (from whence the wine Barolo draws its name), followed by those of Castiglione Falletto and Monforte. To begin with Barolo, we much enjoyed the elegance and roundness of the tannins and the readiness of some of the wines, though Alcohol continues to be a distinctive marker for the vintage, and in some of the wines is over the top. Castiglione Falletto's wines showed the best, thanks to elegance that doesn't (as is often the case) come at the expense of power, and also considerable freshness that always plays a part in making wines ready to drink from the outset. With Monforte, we had quibbles that we hope will fade with time. At present the 2007 Monforte wines seem to be mostly about immediate impact, with little thought for the future, though we are certain that this impression will fade as they develop. For now, here are the 12 wines that impressed the entire IGP Panel. As we have already said, we will publish our personal impressions, which may differ, but here you have the 12 wines (out of 66) wines that impressed us all, in the order they were poured. Tasting were Luciano Pignataro, Stefano Tesi, Kyle Phillips, Pasquale Porcelli and Carlo Macchi. Roberto Giuliani's absence is due to his having come down with the flu.